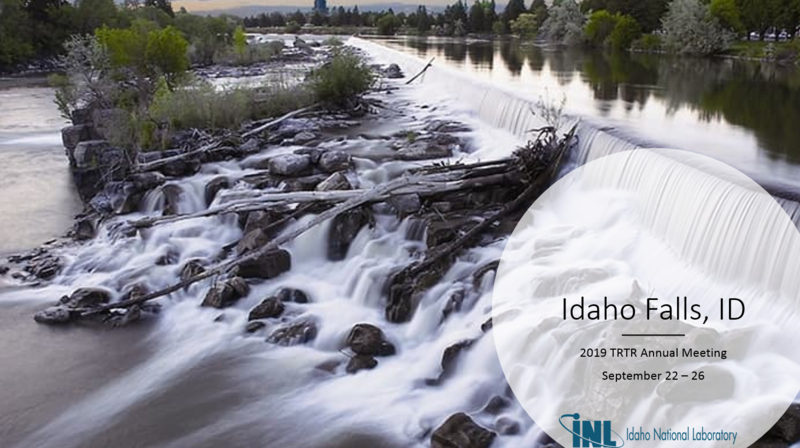 Idaho National Laboratory (INL) is pleased to be hosting the 2019 Test, Research, and Training Reactor (TRTR) Annual Meeting. The meeting will be held September 22 – 26 at the Energy Innovation Lab/INL Meeting center, 775 MK Simpson Boulevard, Idaho Falls, ID. Registration for the event will begin March 1, 2019 and close on August 1, 2019. Details are still being finalized, watch the TRTR website for updates. Each reactor in the United States is unique but they all operate under the same operational principles. With limited budgets and a growing need for sustainability, the need for collaboration for unique solutions to common problems is vital. The TRTR Annual Meeting provides a platform for reactors personnel from across the United States and abroad to come together and solve common challenges. Additionally, time is set aside annually for issues with the regulator and licensee interface. We have 70 rooms available at the Government Rate. Must be Booked by September 1 to ensure rate! Representation by a spectrum of nuclear vendors to address a variety of needs at your facility. Many sponsors bring demonstration equipment so you can better understand how it fits with your needs. Premium sponsors help with social events so you have the ability to better interface with your colleagues. Staff from reactors across the country will gather to present work done at their facility over the course of the previous year as well as upcoming research. Register To Present (Coming Soon)! Question and Answer sessions to openly discuss regulatory issues and concerns. NRC Staff will present regulator views on facility operations and compliance. Upcoming changes in regulations will be presented for consideration and feedback.